When Darrell Mount finished his three years in the U.S. Army in 1977, he didn't have a career in mind. He was back in his hometown of Newberg, working for a friend who owned a tow company and body shop. 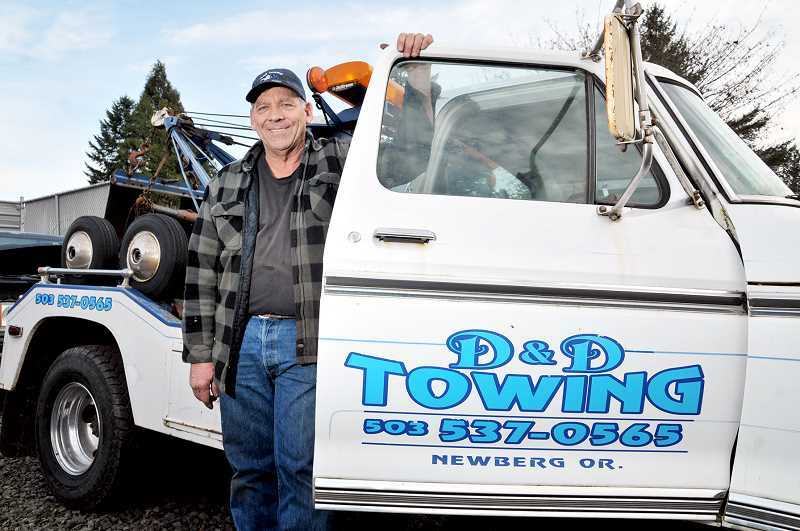 Mount drove a tow truck part-time for that friend; 41 years later, he still has that truck and his work towing vehicles in Dundee and Newberg has made him a local legend. On Nov. 28 at the Dundee Community Center, dozens of friends, family and community members gathered to celebrate the 62-year-old Mount's "retirement" from towing, marked by the sale of his business — D&D Towing — to new owners. Parking for the event overflowed to the nearby church lot. Thankfully, nobody needed a tow out of the mud, although Mount would've done it free of charge. Steve Schoening, a former Dundee police officer, has known Mount for 25 years. He's one of the many who've been saved by "Dundee Darrell" over the past four decades. "The first time we met was when I got my police car stuck in the mud back when I worked for Dundee Police," Schoening, 51, said. "He came out and towed my police car out of there, didn't even want money for it, and he didn't tell the chief." Schoening said that trying to pay Mount for his services was "like pulling teeth" at times. He would always charge less than his competitors, according to Schoening, and often refused to accept money from good friends. "Customer service meant more to me than money," Mount said. "I had the attitude that I'd rather make $50 10 times than $500 one time. That worked for me." He added that he's been to all four corners of the state, and he even drove to Olympia, Wash., when Schoening needed help. His desire to help others even led him to volunteer as a firefighter for a few years, which is how he became good friends with Schoening and established relationships with other first responders in the area. The crowd at Mount's retirement party was filled with police officers in and out of uniform, firefighters and emergency medical personnel. Many of them echoed Schoening's sentiments that he was a force of good in the community, and that he made their jobs easier. Dale Mount, the soon-to-retire EMS chief for the McMinnville Fire Department, is biased. He is Darrell's younger brother and has seen firsthand the kind of impact D&D towing had on first responders and citizens in Dundee and throughout the Chehalem Valley. In the near future, Dale and Darrell will hop on a plane and travel to Lambeau Field in Green Bay, Wisc., to watch a Green Bay Packers game. The trip serves as a celebration for both brothers as they close out their individual careers, and it will be the first time Darrell has been on a plane since he got out of the military. "We've got tickets at the 50 yard-line, four rows back behind the (opponents') bench," Darrell Mount said. "It's going to be a lot of fun. I paid for it and I told Dale it's his Christmas present for the next two years." Before the animated children's movie "Cars" popularized the phrase through its tow truck character "Mater," voiced by Larry the Cable Guy, Dale said "get 'er done" was Darrell's nickname for much of his towing career. His reliability as a one-man operation earned him a lasting reputation. "He's one of those guys that you'd never know helped so many people, because they might seem gruff or have a rough edge," Dale Mount said of his brother. "But he's one of the most giving people you'd ever meet." His impact stretches beyond towing. Every Christmas, Mount picks a less fortunate community member and pays their holiday expenses. He has lent his personal vehicle to customers for a week at a time while their car was in the shop. When friends needed someone to help them work through a rough time, they often turned to Mount. Russ Conroy, 58, is among those whose lives have been changed by Mount's compassion. "It brings tears to my eyes to think about it," Conroy said. "One day, I asked him to borrow $20 for beer, and the look on his face was one that I never want to see again for the rest of my life. I never drank again and it's been almost eight years now." The relationships he built over four decades are what Mount said he will miss most about the job. He'll still be a fixture in the community, however, whatever his next job is. Multiple friends said it won't be long before someone hires him. Mount wants an opportunity to work with his hands – nothing at a desk or computer. He can't quit tow truck driving cold turkey, though, and said he plans to do it part-time for the new owners until he lands another full-time gig. Even then, it's hard for Dundee residents to imagine him doing anything else. Mount remains humble about the impact he had, although he knows driving a tow truck was the perfect career for him. "It's almost like I was born with a chain and a hook in my hand," Mount said. "It comes natural to me. People say it was amazing what I did, and I ask myself, 'what did I do?'"